Roberta Rammê from Brazil did an excellent work creating this furniture concept. As you can see from this pictures this furniture combines 3 elements : beauty, comfort, and functionality, and is specially designed for tech-savvy teenagers. 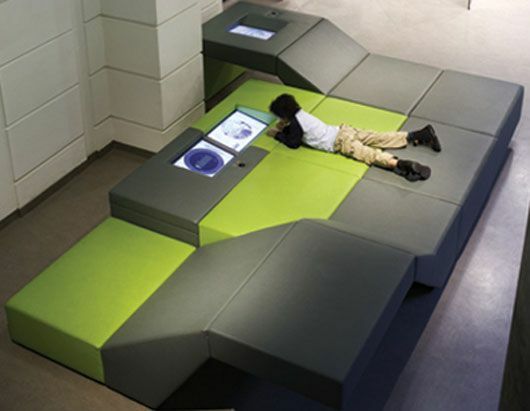 This multifunctional chaise-Longue called Wave Chaise is equipped with a TV, DVD and a music system along with a computer desk in its front. These are just their High Tech characteristics, beside these you can also take a nap, read a book from the little bookcase, study, etc. This furniture concept is inspired by the values and personality of a today’s teenager and the standards generated by a global hi-tech culture of facilities, where the access to technology is cheap and easy.I think that this furniture is something that every teen would want to have in his room.